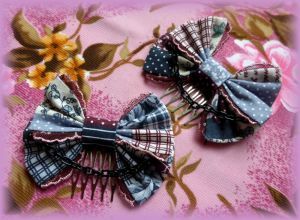 Various versions of combs with decorated bows and ribbons as hair accessories. 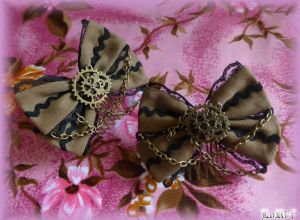 Steampunk-stylized comb in brown color, decorated with black lace and combination of bronze decorations and chains. 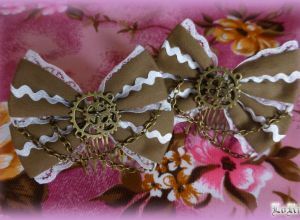 Steampunk-stylized comb in brown color, decorated with white lace and combination of bronze decorations and chains. 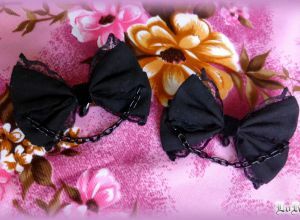 Black hair-bow with velvet ribbon and decoration in shape of black crystal. On the bottom with black closing clip. 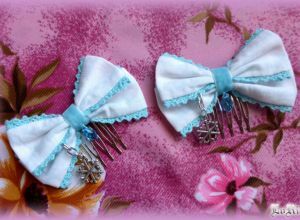 Hair-comb from white bow decorated with sky-blue cotton lace. In addition with two pendants - in metallic snowflake shape and imitation of semi-transparent sky-blue crystal. 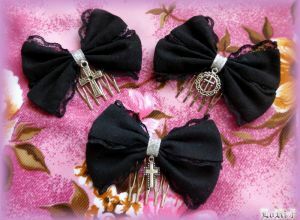 Three combs decorated with three different pendants in shape of cross and silver ribbon. 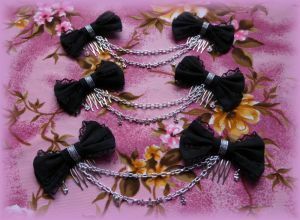 Double comb is made from black cotton base material and black lace. The silver decoration is done by black middle ribbon, double silver chain and pendants in shape of tiny stars. Every one of them has specific additional pendant decoration. 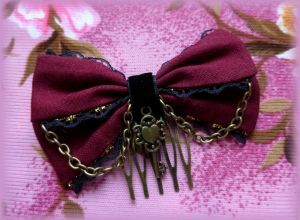 The comb is created from burgundy cotton material, golden-black lace and velvet ribbon woven in the middle part. Luxurious look is formed with bronze metallic chain, the comb itself and beautiful Victorian key pendant. 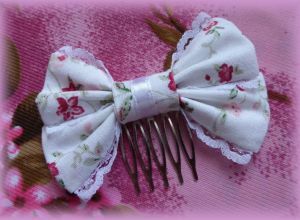 Comb with bow from pink print of Lilian Garden model. 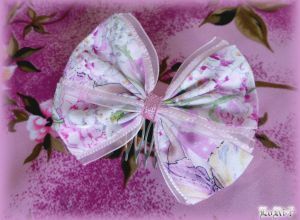 Wide double bow decorated with pink soft ribbon is tighten in shape of spread butterfly wings. 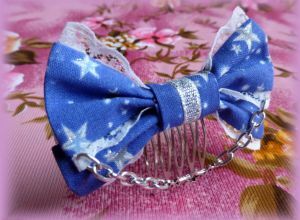 Comb with beautiful soft-blue cotton material and print of night sky full of stars. It is combined with white ribbon and silver chain with decorative star pendant. Comb with beautiful deep-blue cotton material and print of night sky full of stars. 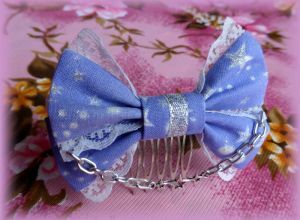 It is combined with white ribbon and silver chain with decorative star pendant. 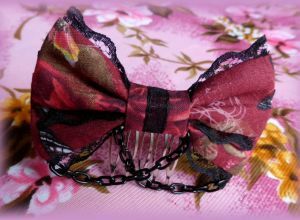 Deep-red cotton print of flowers and butterflies is combined with black lace, semi-transparent black ribbon and black metallic chain. Deep-red cotton print of tiny white flowers is combined with black lace, semi-transparent black ribbon and black metallic chain. 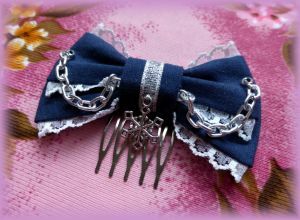 Comb from navy-blue cotton, snow-white lace, chain and snowflake metal decoration in silver color. 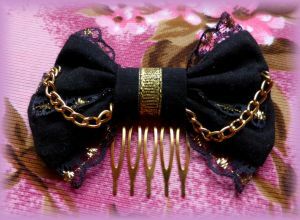 The golden-black comb from black cotton, golden-black lace, chain, ribbon and comb itself - all in golden color. 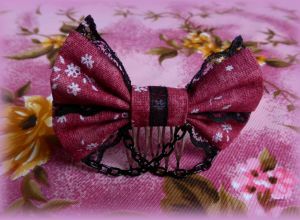 Little bit wider ribbon from gorgeous patchwork material edged by burgundy-pink lace and black metallic chain. The comb from white cotton print of red flowers. Is simply decorated with ribbon and lace - both in white color.